Shohola Falls Trails End | Welcome to Trails End! 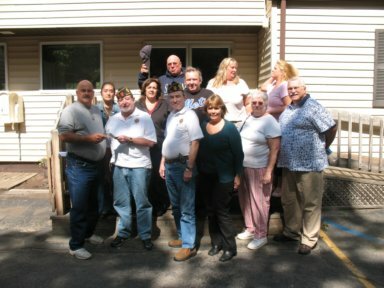 The photo is the Board of Directors along with Chaplain Tom Cargill and Marie Cargill, giving the American Legion of Milford, PA a donation of $2500 to be used to purchase needed items for the troops in Iraq. The donation was raised by the Trails End Property Owners Association, including the chapel, and funds were matched by the association this past summer. *Boil advisory* Due to a power outage on 3/29 we experienced a drop/loss of water pressure. DO NOT DRINK THE WATER WITHOUT BOILING IT FIRST- Bring water to a boil for 1 minute, then let it cool before drinking. Please do this or use bottled water until further notice. Please remember, per Trails End POA Bi-Laws Article XIII section 13.6- all renters must be registered with the office, this includes a completed registration form and copy of government photo ID. Leaking Hydrants: It is extremely important to report all leaking hydrants to the office, as well as, any visible water leaks! This will help keep our water usage down which is necessary to keep us from having to meter each lot. We also ask all property owners to turn off their lights (indoor/outdoor) and disconnect electric when you leave to conserve on our electric use. Unplug electric and turn-off breaker? Disconnect all fittings and hoses from hydrant? Notify the office of any changes in your address and/or phone number? Did you winterize your trailer? Anti-Freeze, Backflow Valves, Plugs, & Electric Locks are available at the office. Prices may vary. Stop in or call (570)296-8542 with any questions! Reminder: Anti-Freeze should be used while winterizing - DO NOT pour any other chemicals down the drain as this affects the sewer plant and is a violation of DEP. If you have any questions, please contact the Association Office. In need of stone for your property? Stop by the Trails End Association Office and order today! Same day delivery is available (some exceptions apply) and must be paid prior to delivery. All outside lights must be off when your lot is unoccupied and during daylight hours. All fittings (i.e. Y-connections) and hoses must be removed from water hydrants October 15th through April 15th when the property owner is not on property. A $25.00 fine will be imposed if the fittings and/or hoses are not fully disconnected during this time while the lot is unoccupied. Hydrants must be visible at all times. Structures and/or Locks are not permitted around or on hydrants. If the maintenance staff is required to remove such items a $25.00 service charge will be billed to the property owner. Trails End POA is a recreational camping community in Shohola, Pennsylvania, located in Pike County on scenic Route 6. It is a four season community, open to property owners any time of the year; however, most members enjoy staying throughout the summer months (May through September). Located 14 miles east of Lake Wallenpaupack, the largest lake in the Pocono Mountains - 52 miles of shoreline to be exact! 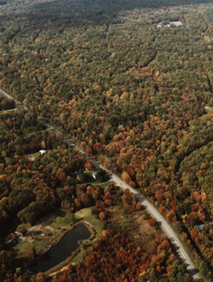 Trails End, incorporated in 1972, encompasses 400 acres with 1851 lots. Each lot is approximately 50ft. x 90ft. (4500 square ft.). Each lot can be equipped with one RV or Camper (max. 400 sq.ft. ), one shed (max. 100 sq.ft. ), one open deck or screen room (max. 10ft. X 30ft. ), etc. More building guidelines are available in the office. Always check if permits are required before changing or building anything existing or new on the property. Gated Community, with Security building at the gate, staffed 24 hour/day, 7 days/week, a roving patrol guard is out 24/7 also! Bar - Wing Night - Every Wednesday! Opens 7pm every Friday & Saturday with entertainment. Additional Days/Times added during holiday weeks. Basketball Court - Brand New Hoops installed in 2016 - Smaller hoops are available during the Basketball season! Playground - A large play area was added Spring 2016 and Spring 2017! Covered Pavilion: located by the outdoor pools.great for a shaded place to sit and eat! Staffed with an extremely helpful and friendly Maintenance Dept. Comfort Stations - Very clean, Heated, most are equipped with showers. A great ammenity to have while entertaining company! DJ/Live Bands every Friday & Saturday in the summer when the bar is open! Arts & Crafts - kids crafts are available on a daily basis, adult crafts are also available - Check the Happenings! Sip & Paint and Fairy Garden Events! Trips to Dorney Park, Casinos, & Concerts at Bethel Woods! Annual Kids' Halloween Party held Columbus Day weekend followed by the Adult Costume Party at the bar w/entertainment!